Team VSR Driver Joshua Conquer had an amazing debut in his first ECKC Race in the Senior Briggs & Stratton Class as he moves from Junior to Senior this year. 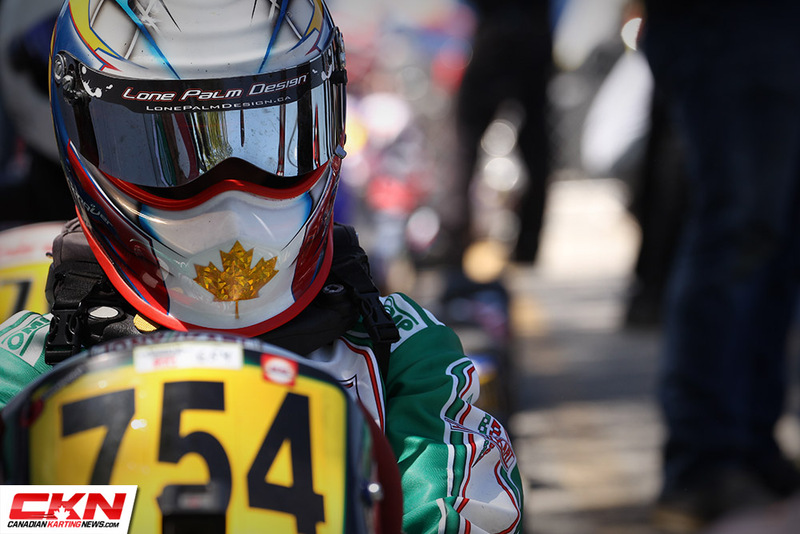 This past weekend was the Eastern Canadian Karting Championship. This is what most of us plan and test for all season long. There is a lot riding on this championship. So, with this year being only a 3-round series it means more pressure and less opportunity for mistakes. As the weekend approached I felt a little nervous because there are a lot of people asking if I can keep the pace from last year, but, after Ron Fellows last weekend I felt I could. With this year being my first year as a Briggs Senior I’m coming in open minded. Watching them last season was cool because I could really look at who was doing what and to learn from it and build on knowledge to take into this coming season. After having such a great season last year, we are looking to build off of it and try to keep up our performance. With a tough task ahead I know there will be ups and down throughout the season. Being the new kid on the block doesn’t help either. I will be tested very early in the season as to whether I am truly ready for Senior. If I can survive we are looking to show strong at all major events and hopefully translate that into a top-5 in all major championships. After Friday practice, I was feeling pretty good about my pace for the weekend. Not knowing who I was going to work with in qualifying, I turned to the Energy Kart guys (Marco Signoretti and Alex DaSilva) to see if they were willing to take the rookie under their wing for Qualifying, and that they did. So, with having some teammates to work with I was feeling a lot better about the weekend knowing that I have two of the best drivers in the class to work with. With that we had a solid qualifying run putting us all close or inside the top-10. Starting upfront was a real accomplishment and something to build off. Starting fourth in the Prefinal, we got a good start and slid in behind Marco to stay where I started. Trying to pull away from the rest of the field we caught a slow lap kart who was trying to restart his motor in the middle of the track as we approached turn four and it collected the leader, Michael Glaze. Avoiding him, it moved me up to third with my buddy Gavin Sanders right behind. Working with Marco and Gavin trying to catch the leader Tyler McCullough, just as we caught him Marco broke a chain and his race was over while I finished p2 to start the Final on the front row. Starting off pole for the final, I got shuffled back until corner six where I was in seventh. Having to move my way back up I started picking off kart after kart, lap after lap. And on the second last lap I caught Michael and Tyler. I pushed Mike by Tyler to move me up one more spot to second but on the last lap in corner five I got tangled up with Tyler, turning him around and leaving me with full throttle, however I managed to hang onto third place to score a podium. On Sunday, we were in for a wet one. 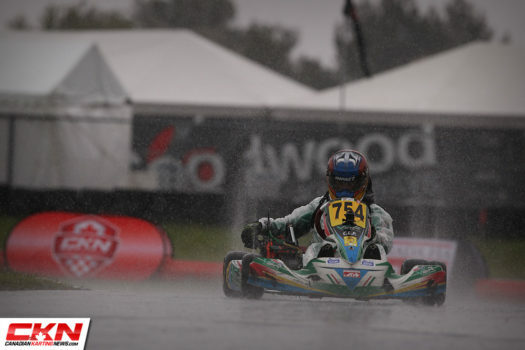 With having a good qualifying and a strong comeback after my spin in the prefinal, in which most of us were on dry tires when the rain came pouring down, we were all ready for the full wet race everyone was expecting. Having registered tires they were intermediates at best I was a little worried. But with a strong showing for Eli Yanko and Jack Young I was feeling a little better about where we were at. So, for my First ECKC weekend as a Senior I’d say that was a successful weekend for me. With a full wet weather setup on we were poised and ready to go. To get myself pumped up a little bit I said to my dad “lets Verstappen this sh*t”. Off the start, we had a better run then the outside moving me to third behind Alex Murphy and Alex Da Silva. Getting by Murphy in four put us behind Alex and Marco, who snuck by on the inside. Getting used to the wet track a little more the kart just felt like it was on rails, lap after lap each one faster then the next. As I came up on Marco I knew that he wasn’t going to make it easy to get by. After pushing him for three laps I forced him into a mistake which gave me the spot. Then there was Alex. A few fast laps put me right up behind him in no time. Making a cross over move coming out of turn one gave me the upper hand and put me in the lead. With just setting my eyes on the prize I never looked back and got my first Briggs Senior win and It came at a national level event. So, for my First ECKC weekend as a Senior I’d say that was a successful weekend for me. With achieving and surpassing our goals for this weekend I think that we can keep our pace from last season and give some of the top Senior drivers a run for their money. This coming weekend I will be racing both Briggs and Shifter at Mosport if it is dry. If not I will only be racing Briggs so let’s hope for no rain. I hope to see all of you in Tremblant in a week. Be sure to follow us on Facebook and Twitter for the most recent updates.